We scribblers on Figures of Speech like to take the Olympian viewpoint, gazing down with harmless amusement on the Greek tragedy that is modern life. The real inhabitants of Olympus are less benevolent: wishing to destroy the ant-like upstarts scuttling about down there they have clearly driven them mad, the traditional first step on the path to oblivion, we hear. One of the most easily appreciated cases of this divine psychosis can be seen in the field of energy, its generation, distribution and use. Crazed by the thought of the end of humanity that will be brought about by our emissions of the completely innocent and beneficialtrace gascarbon dioxide, the rulers of the advanced nations have decided to preempt that terrible end by committing civilisational mass suicide first. A schematic diagram of a traditional energy generation and distribution system. Image: ©FoS. The most important feature of this system is that all its energy is stored offline and is available on demand. 'Offline' means that it is either in the ground, in water reservoirs, in nuclear fuels, or buffered in storage tanks and coal bunkers, in pipes, in road tankers, in filling stations, in oil-heating tanks or in the fuel tanks of vehicles etc. 'On demand' means that we use it when we need it: if we don't need it, it remains there until we do. We can lay down whatever strategic reserves of whatever fossil fuel we deem to be appropriate. With new discoveries of gas and oil fields around the world the problem of energy dependence has disappeared. The electric power we need is generated on demand by many large generating units. These can reliably supply continuous electric power at a very stable frequency for distribution via the grid. The grid only needs to cope with the demand for electrical energy: apart from electrified railways, most of the other energy requirements are met by direct use of stored fossil energy. The design of the grid is fairly simple, being only required to handle relatively steady loads and cope with local failures. Voltage conversion is undertaken by simple, low-tech transformers. All the components of the system rely on well-understood and well-proven technology and (apart from nuclear power) allow easy maintenance, long life-cycles and reasonable amortisation. A 'decarbonized' energy generation and distribution system, designed by a lunatic. Image: ©FoS. The only on-demand components in the system are hydroelectric and nuclear power. Every other energy source is completely erratic: they produce electricity whether we need it or not and may not produce when we need it. The wind may or may not blow, may even blow too much; clouds may cover the sun and so on. The entire system uses electricity as its distribution medium. The distribution grid will have to handle loads far greater than at present, for example charging motor vehicles, supplying all the cooking that is currently done by gas and so on. The inputs to the grid are not only variable in amplitude but also variable in type: DC, AC with large frequency variations requiring a lot of electronics to keep the grid running. Such a 'smart grid' will be extremely expensive to install and to run, probably a multiple of the cost of the energy generation itself. The introduction of 'smart meters' for electricity consumers will also cost an immense amount of money and generate not one watt of power. 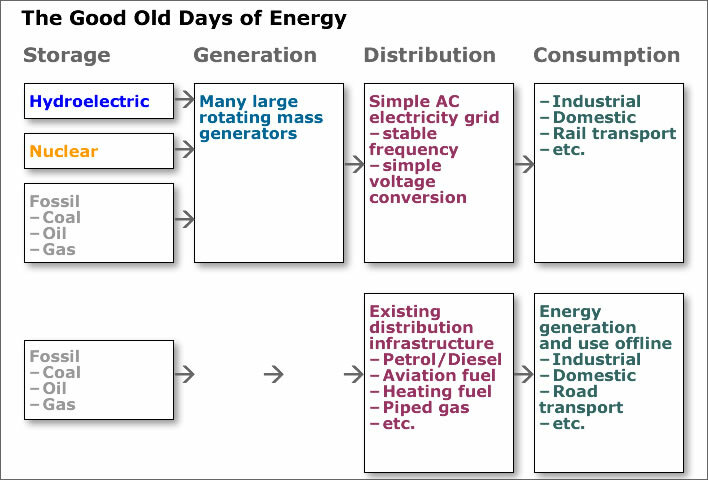 Now we have no pre-generation offline storage of energy, some kind of storage of electricity after generation is essential. Because generation may be reduced to a few percent of capacity for several days or more, electrical storage has effectively to produce the entire normal output for this period. Furthermore, storage presupposes that generation produces sufficient excess electricity to be stored, meaning that the normal output of the system has to be appreciably higher than the normal demand. All the 'green' electricity generation schemes so far have proven themselves to be inadequate, unpredictable sources of power. They are economically unviable without huge subsidies and are ecologically questionable (environmental damage). Once we accept the scientific evidence that carbon dioxide plays almost no role in determining global climate, the reason for the transition from the old system to the new system disappears. Remove the carbon dioxide psychosis and we must immediately ask the question: why are we doing this? Why are we wrecking a proven, stable energy generation and distribution system for no reason at all? The lunatics' world appears to be completely rational to the lunatics themselves. We Olympians can only shake our heads and wait for the inevitable working out of this tragedy. Those who are suffering and who will suffer even more from fuel poverty just have to bide their chilly time until the moment comes when they will tread the stage as the godly instruments of divine retribution. But what about 'Peak Oil', you say. Even if carbon dioxide is harmless we should cut back on fossil fuel consumption to preserve these resources. It is self-evidently true that fossil fuel reserves – and any other reserves for that matter – are not infinite. The uncertainty begins when we try to state how finite they are. Ever since the concept of Peak Oil – the moment at which oil production would peak, to be followed by a terminal decline – was invented in 1956 each and every prediction of the date at which this peak would occur has proved to be wrong. And there have been a lot of predictions. They have been wrong because they are ultimately guesses, irrespective of how much learnèd calculation goes on behind them. The predictions have all been unable to foresee technological advances in fossil fuel extraction, discoveries of new reserves and changes in consumption. These advances are fundamentally all surprises – that's why we call them 'discoveries', 'inventions' and 'innovations'. Consider this: barely 25 years ago the internet was unknown – about Google, Wikipedia, online banking, shopping, news media, social media, email etc. etc. we had no idea, none at all. Also barely 25 years ago we had no widespread use of mobile telecommunications. The corollary of the Peak Oil concept is that we should wean modern life off its dependency on fossil fuels before they run out. This argument is one of those socialist, mercantilist, authoritarian, autocratic, top-down-management ideas that have brought so much misery to mankind throughout history. We laissez-faire, free market, capitalist thugs prefer to rely on that tried and tested mechanism, the market price arising from supply and demand. The increasing fossil fuel prices of the 90s forced the discovery of new sources and the development of new technologies. We now have the lowest fuel prices and the greatest fuel independence we have had for a very long time. The market works. When – not if, when – fossil fuels get harder to extract and their supply is reduced then the price will go up. Consumers will find ways to cope with higher prices as they always have done and innovators will seize the opportunity to replace fossil fuels with other things. They won't need subsidies: the price level will make such innovation worthwhile in itself. As the innovation matures, prices will come down again. The increasing price of fossil fuels will receive democratic toleration, because 'that's how it is'. Citizens can easily grasp the idea of scarcity leading to higher prices. In contrast, the mercantilist solution is to do what mercantilism has always done, that is, rig the market. Fossil fuels are given high levels of taxation (e.g. 'carbon taxes' etc.) and non-fossil fuels are given high levels of subsidy. The price of energy rises, as do the prices of everything else, since they are also dependent on energy prices. The ultimate victim, as always, is the consumer, either directly or through higher prices on goods and services passed on by companies. All mercantilist solutions rely on coercion, that is, enforcement and compliance. Confident of their ability to coerce and bamboozle their citizens, a few countries have been stupid enough to go it alone down the decarbonisation path, forcing them to increase their prices and decrease their competitiveness. For these countries, Nemesis is already on the way. The mercantilist retreat from fossil fuels has to be a global act, in which all the citizens of the world have to be simultaneously coerced into accepting prices that have been artificially raised. Some dreamers openly talk about 'global' governments or 'supranational' institutions, for the good of the whole. It is not surprising that the fundamentally fascist ideas of Jean-Jacques Rousseau about the 'General Will' and the 'General Good' are currently being revived to legitimise philosophically the rule of a quasi-rationalist, quasi-scientific autocracy that will be needed to 'save the planet' (our most recent discussion of this theme offers an overview and links). It's for your own good. Where have we heard that before? With the discovery of new, immense reserves, the moment of Peak Oil has now retreated far into the future. The latest argument is that we may indeed not be about to run out, but that we should leave these plentiful reserves in the ground. This idea foresees even more top-down, authoritarian mercantilism than the old Peak Oil theory. In other words, the world may have a century or two of fossil fuel use ahead of it, but the switch has to be thrown now. Why? In 50 or 100 years' time the technological possibilities will be much more numerous and the available solutions to energy generation much better. By the time we really need to rethink our energy supply our current silly obsession with half-baked solutions such as wind, solar, wave and tidal systems will seem quite amusing, because we have arrogantly bound ourselves early to immature technologies and have applied them too widely, too early. “There are challenges ahead in managing system security. And system security is essential in order to allow reliable electricity supplies to be provided to customers. “The changes that need to be made centre on the physics of energy supply, transmission and meeting demand,” Mr Pierce said. Large deviations or rapid changes in frequency can cause the disconnection of generation, potentially leading to cascading failures and ultimately a ‘black system’. Spinning generators, motors and other devices synchronised to the frequency of the electricity system have naturally provided the inertia necessary to allow the system to cope with uncontrolled changes in frequency. New technologies such as a wind or solar have no or low inertia. Currently they have limited ability to dampen rapid changes in frequency. “Finding new ways to provide inertia and respond to frequency changes is where work is required and it is well underway,” Mr Piece said. The full report (85 pages, PDF) is available for download from the cited page. Britain is resting on huge, easily accessible reserves of high-quality natural gas. Using proven, efficient and inexpensive Combined Cycle Gas Turbine (CCGT) powerplants, Britain could reliably cover its energy needs for a long time to come. Those two dreams of the 70s, energy independence and energy security would have been realised after all these years. The problems of competing with subsidised renewables. From a technical point of view, gas power stations would be expected to operate for at least 25 yrs, which is the assumption made by BEIS in their recent study of comparative generating costs. But would a new such plant, launched in say 2025, still be allowed to operate in 2050? Obviously, from everything we have been told, the answer would be no. Indeed, it may be forced to close much sooner than that. This uncertainty is a huge problem in itself. The Capacity Market auction, for instance, only offers contracts for 15 years. The other big uncertainty is what will happen to the carbon pricing. Currently this is set at £18/tonne CO2 above the EU ETS price, a total of about £23/tonne at the moment. This equates to about £8/MWh for a CCGT generator. However, the Committee on Climate Change expects the market price for carbon to have risen to £42 /tonne by 2030. Worse still, they are wanting the government to set a much higher “target price” of £78/tonne. The latter would push the cost of carbon pricing up to £28/MWh. With fuel and other variable costs of around £40/MWh, the marginal cost of a CCGT plant by 2030 could have risen to £68/MWh, well above the current wholesale price. Unless you can at least cover your variable costs, you are better off stopping in bed. And it gets worse! All government projections assume that the carbon price will have to carry on rising sharply after 2030. The BEIS study, for instance, assumes it will rise to £200/tonne by 2050 (all at 2014 prices). Paul is far too polite to draw the obvious conclusion, we on this blog less so: Tesla Tumbrils! Members of the warmist cult will be wise to avoid presentations such as the following, in order not to risk a painful bout of cognitive dissonance. The video will already be known to the knuckledraggers who hang around denialist websites, but it is a simple, calm and effective presentation about CAGW and fossil fuels and it deserves a wider audience. It was recorded in 2015. The speaker is Dr. John Christy, the Distinguished Professor of Atmospheric Science and Director of the Earth System Science Center at the University of Alabama in Huntsville. With Dr. Roy Spencer he developed the UAH satellite temperature record. The full video lasts just over an hour, but the presentation itself takes the first 45 minutes – time well spent.